This is definitely one of my favorite pictures of all the pictures of my boys on these beer pages. 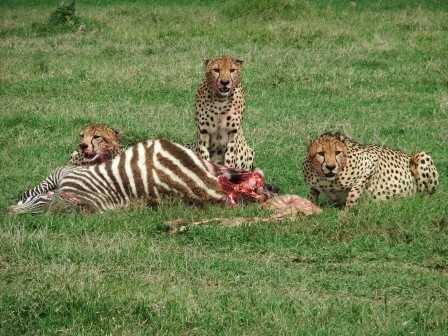 Just wonderful acting on the part of Calvin, fortuitous animal finds on my part (a cheetah’s “pursuit” of a zebra), and decent staging for once. The price of the six pack was worth this picture (to me) alone. And a funny thing about the purchase of this six pack – I bought it in West Hartford at a store sort of known for carrying lots of high-end craft beer. There are a thousand beer choices. I was only in there to get something specific for my wife (the WAY overpriced Evil Twin Nomader Weisse) but saw this new Half Full offering in the can. So I picked it up and made my way to the checkout and… the woman in front of me also had a sixer of the Pursuit IPA. That’s pretty weird, right? So weird, in fact, that I turned tail and pretended to go look for something else. I just didn’t want to plunk my same random middle-of-the-road IPA next to this other lady’s purchase of the same. What I’m trying to say is, I am terrible at small talk, I don’t often like to talk to strangers, I hate when people inflate mere coincidence to be something more than it is – and either she or the dude working there would have totally done that – and … okay, I just really didn’t want to talk with anyone at that moment. In pursuit of passion. Of a bright idea that matters so much it moves you to act. Our pursuit is a nonstop adventure: Ditched stable jobs to draft a plan, gathered a crew to convert an old factory, built and became Half Full. And we’ve only just begun. Half Full Pursuit IPA, the perfect inspirational pairing for whenever you find yourself… in pursuit of passion. This is some serious beer, eh? They left their jobs at the horse farm to start a brewery and anytime they want to pursue a passion, they drink this IPA. Serious, serious stuff. In 2014, judging these “gateway IPA’s” is rife with pitfalls. With so many big and bold and hop-centric citrus-forward flavor and aroma bombs out there, a good, no-frills straight up old school IPA sort of gets forgotten about or dumped on. It’s almost Pavlovian now… you see IPA and you expect a hoppy punch in the face. 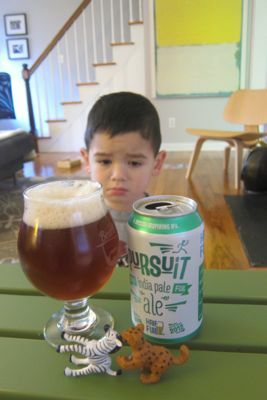 Well, you’re not getting that from the Pursuit IPA. How could you expect to be inspired while being so distracted by some delicious hop-forward beer? You can’t, so Half Full is keeping it old school and very real for YOU. So YOU can PURSUE your PASSION. All I know is I drank a bunch of this beer and pursued my passion, but my wife, who had not had any beer that night, shot my passion pursuit down. Right quick. This beer will not wow you (or get you any action, apparently) but it won’t upset you either. This is an IPA before IPA’s became IPmotherflippin’A’s. It’s solid, and dry and bitter and tastes like an old school IPA. More Great Homemade Ice Cream!